We invite you to be a part of Wine and Wonder, a Magical Evening, to celebrate and support the work of United Way of Westchester and Putnam in its 56th year. 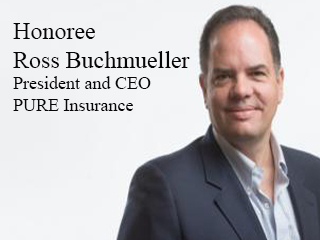 The event will recognize Ross Buchmueller, President and CEO of PURE Insurance. Ross has not only imagined but contributed to improving our community through his philanthropic, business and volunteer activities. He has stood steadfastly by the work of United Way. We are delighted to be able to honor him. Your purchase of a sponsorship, tickets, and/or advertising for the event will fuel the work of United Way in Westchester and Putnam. Name as “Presented by …” on all promotional materials; 30 preferred seating event tickets; Podium speaking opportunity; Logo to appear on step and repeat; Full page color ad on premium page of program journal; 1-minute video interview for our website and social media; Logo to appear on auction bid sheets and panels; Social media recognition before, during and after the event; Logo to appear on header image of UWWP’s social media; Website attribution/link to company page; Recognition throughout the year at other United Way events; Logo to appear in event slideshow; Plaque recognition; Invitation to serve on the steering committee All journal ads include printed journal, electronic journal with live links and ads shared on social media platforms. 20 preferred seating event ticket; Full page color ad in program journal; Podium mention; Featured visibility on invitation, program and event signage; Social media recognition before, during and after the event; Logo to appear on header image of UWWP’s social media; Website attribution/link to company page; Recognition throughout the year at other United Way events; Logo to appear in event slideshow; Plaque recognition All journal ads include printed journal, electronic journal with live links and ads shared on social media platforms. 12 preferred seating event tickets; Full page color ad in program journal; Podium mention; Featured visibility on the invitation, program and event signage; Social media recognition before, during and after the event; Website attribution/link to company page; Logo to appear in event slideshow All journal ads include printed journal, electronic journal with live links and ads shared on social media platforms. 2 tickets and a half-page, black and white ad. Call 914-997-6700 x737 or email [email protected]. 336 Central Park Avenue, White Plains, NY 10606 US.